Celebrating 10 years in business in 2018, Ryanway Ltd is a leading refrigerated transport company based in Midleton, Co. Cork. The family-run business provides a Cork / Dublin groupage daily service as well as nationwide refrigerated distribution, a 24-hour express van service, chilled and frozen groupage and full loads / part loads / pallet / box. Michael Ryan has been involved in the food industry in Ireland for the past 35 years. He started out as a chicken and egg distributor operating as Imokilly Eggs and Poultry World which led him into the food haulage business. Ryanway Ltd was established in 2008 by Michael Ryan and Padraig Ryan and has since grown to employ 12 staff and run 10 vehicles. The refrigerated transport specialist operates from CGI Food Park in Midleton, which gives it access to loading bays, chilled and frozen stores and transhipping among other things. “We rent a space from CGI ColdStores which works well for us. It’s in a great location and gives us access to a wide range of facilities,” explains Padraig Ryan, transport manager and son of Ryanway founder, Michael. “We specialise in the distribution of ambient, chilled and frozen products throughout Ireland and have built up a large and loyal customer-base over the past decade. My father has been in the business for 40 years and has a wealth of experience and knowledge of how it works. Our goal is to provide unrivalled logistics solutions and to ensure our clients’ products are delivered on time, safely, securely and at very competitive rates. Ryanway’s commitment to the customer begins as soon as it receives the order until the time their products are delivered safely and on time. The vast majority of its clients come through word of month recommendations. Its main customers include Bandon Vale Fine Cheeses, Coolmore Fresh Foods, Traditional Cheese Company, Deli Meats and the Carbery Group. Bandon Vale, who are Ryanway’s longest-standing customer, have been supplying a range of quality cheeses to the retail, catering and food ingredients sectors since 1994. The West Cork company is dedicated to providing quality products and offers an extensive selection of shredded, block, sliced and pre-packed products, ranging from cheddars to bespoke blends and mixes. Also based in Bandon and celebrating 30 years in business, Coolmore Fresh Foods is one of the largest cake manufacturers in Ireland. Traditional Cheese Company in Western Industrial Estate, Dublin 12 has been supplying speciality cheese and fine foods to the Irish market for over 30 years, while the Carbery Group in Ballineen, Co. Cork is a global leader in food ingredients, flavours and cheese. With its eye-catching red and white livery, the immaculately turned-out Ryanway fleet consists of five Scania artics, a Renault Premium artic, three DAF rigids and a Renault Master refrigerated van. In addition, the company runs 3 Gray and Adam trailers and has two more on hire from Hire Fleet in Carrigtwohill, Co. Cork. The trucks are maintained to the highest possible standards at all times and are equipped with the latest technology to protect the integrity of your goods and products. Maintenance and repairs are carried out by John Fenton in Carrigtwohill, Kelly Commercials in Little Island and Fitzgerald Commercials in Midleton. Padraig is full of praise for Ryanway’s nine-strong team of drivers. 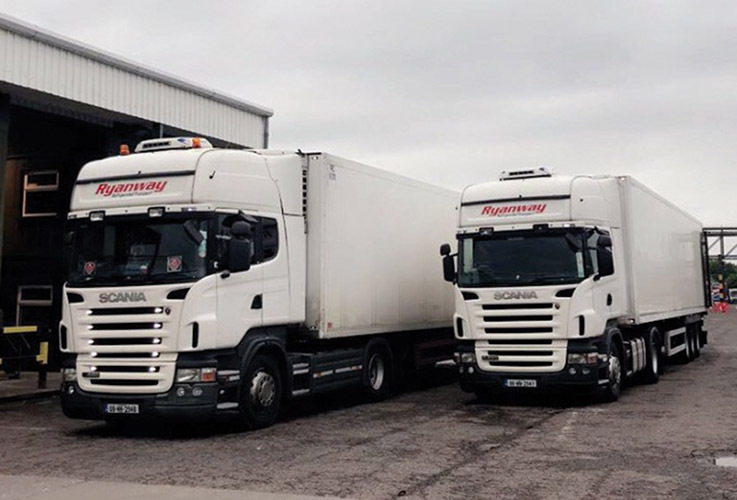 Ryanway has three trucks dedicated to its Cork / Dublin groupage daily service which mostly involves transporting cheese products for Bandon Vale. Its nationwide refrigeration, 24-hour express van, chilled and frozen groupage services are also in high demand. “Our groupage service between Cork and Dublin is our core business,” Padraig says. Ryanway Ltd would like to take this opportunity to thank its customers for their continued support and loyalty. Here’s to the next 10 years of the successful refrigerated transport expert!